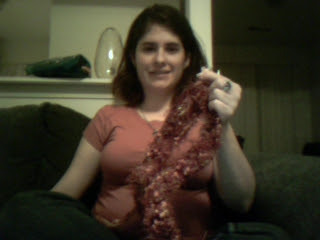 Let's Knit2gether was another of the first Podcasts I started watching when I first purchased my iPod. Over time, I've been inspired to try many of the topics discussed by Cat, but sadly not many of them have panned out yet ;) But I'll keep trying! Cat is a very knowledgeable knitter, but at the same time she makes mistakes too, which is great because then she can teach you how to get out if it when you do the same thing! For example, she had knitted up pieces for a poncho, and then discovered part of it was too small. I think my favorite episodes have been the Sheep and Wool festivals. Its awesome to see the sheep, and watching the progress of the wool being turned into a workable material. One of the festivals even had a "Sheep to Shawl" contest! I can has angora rabbit? I'm envious of such a huge event for knitters, and I'm hopeful that one day Central Virginia will have something similar, as knitting and other crafts become more popular.